I love making ice cream. In the summer, there are always a few flavors available, and I like to mix things up a bit. But when I made this ice cream from the book Scoop Adventures for the first time, I immediately made another batch. And then another. And more. 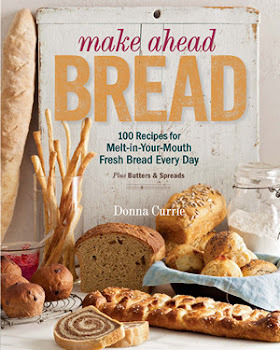 Oh, and I have a copy of this book to GIVE AWAY. Check the end of this post for details! The recipe calls for unsalted natural peanut butter, but I used plain old Skippy, because it's what I have around here. I'd suggest using whatever peanut butter you like - and it would probably be great with other butters, too, like cashew butter or pecan butter. Or even sunflower or pumpkin seed butter for folks who can't have nuts. I alos didn't use the jelly this recipe calls for. I was the weird kid who liked plain peanut butter on white bread or jelly on toast - but not the combo. I don't actually hate it, but I don't love it, either. So, I skipped the jelly in this recipe. I did, however, experiment with using a bit of chocolate sauce as a topping. It was pretty darned good. But if you're a PB&J fan, go ahead and add the jelly as the recipe suggests. And - here's a little tip. I found that mixing the peanut butter and the ice cream base went a lot faster when I used my stick blender to do the mixing. The mixture was perfectly smooth, as was the ice cream. 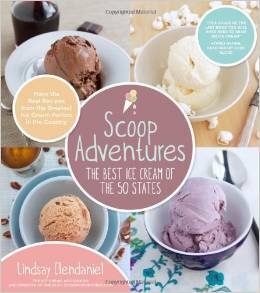 Recipe from Scoop Adventures by Lindsay Clendaniel (Page Street Publishing; March 2014) Printed with permission. Fill a large bowl with ice water. In a small bowl, combine 2 tablespoons (30ml) of the milk with the cornstarch, whisk and set aside. Whisk the peanut butter and salt in a medium bowl and set aside. Combine the remaining milk with the heavy cream and sugar in a medium saucepan and place over medium heat. Bring the milk mixture to a low boil. Cook until the sugar dissolves, 3 minutes. Remove from the heat and gradually whisk in the cornstarch mixture. Pour into the bowl with the peanut butter and whisk until smooth. Set the bowl in the ice water bath to cool, 20 minutes, whisking occasionally. Cover and refrigerate until well chilled, at least 4 hours or overnight. Once chilled, pour the ice cream base into an ice cream maker and churn according to the manufacturer’s instructions. Continue to alternate layers of jam and ice cream until the container is full, gently swirling with a spoon (careful not to muddy the ice cream). This post is part of Ice Cream Tuesday, created by Jenni from Pastry Chef Online. 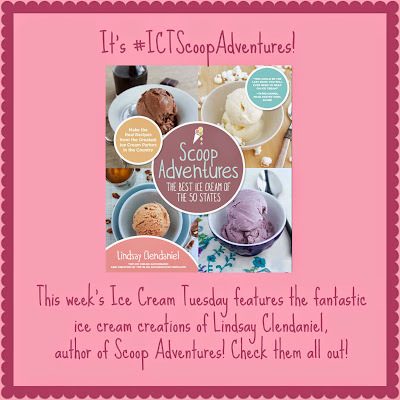 This week, bloggers are all making ice cream from the same author (from her book or blog), so make sure you check out all the participating blogs - and enter to win your own copy of Scoop Adventures, below. Check out more amazing ice creams on Pinterest.